Brooklyn, NY: Restless Books, October 4, 2016 (208 pp; $15.99 paperback, $14.99 eBook), ISBN 978-1632061034. Published in Spanish by Anagrama (2015). Translated from the Spanish by Megan McDowell. Carlos Fonseca Suárez, who lives in London, is a British Academy postdoctoral fellow at the Centre of Latin American Studies, University of Cambridge. He earned a PhD in Latin American Literature from Princeton University and is preparing a book manuscript from his dissertation, which was titled “States of Nature: Catastrophe, History and the Reconstruction of Spanish America.” Fonseca was born in Costa Rica and grew up in Puerto Rico. His interests include art history, theatrics in writing, archival fiction, and philosophy. Fonseca’s work has appeared in various literary journals. 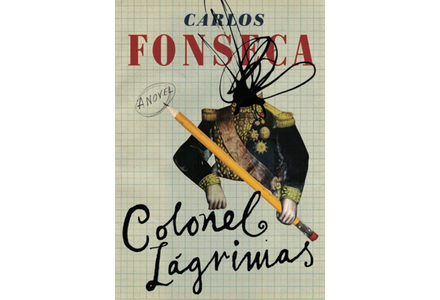 Colonel Lágrimas is his first novel. Originally from Kentucky, Megan McDowell now lives in Santiago, Chile. She has translated four books by Alejandro Zambra, one of which earned the 2013 English PEN Award for Writing in Translation. In addition to articles in magazines and literary journals, McDowell has also translated books by Lina Meruane, Álvaro Bisama, Carlos Busqued, and Arturo Fontaine. Ilan Stavans and Joshua Ellison started Brooklyn-based Restless Books in 2013. Publisher Stavans, a PhD of Columbia University, is the Lewis-Sebring Professor in Latin American and Latino Culture at Amherst College. He has received a Guggenheim Fellowship, Chile’s Presidential Medal, and the Jewish Book Award. His numerous books include a novel (The Disappearance), a book of short stories (The One-Handed Pianist and Other Stories), a memoir (On Borrowed Words), essay collections, edited anthologies, cartoon collaborations, a children’s tale about bullying (Golemito), translations, and multi-volume editions. Conversations with Ilan Stavans is a collection of interviews from his long-running PBS television series La Plaza. He cofounded the Great Books Summer Program at Amherst, Stanford, and Oxford. 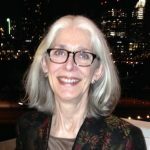 Ellison, co-author with Stavans of Reclaiming Travel, was executive editor at Restless Books and the founding editor of Habitus (a journal of international Jewish literature). His work has appeared in The New York Times and on National Public Radio. Nathan Rostron is current editor and marketing director at Restless. A former editor at Little, Brown and Company, Rostron helped launch Bookish, an online book discovery startup. Restless Books is not currently accepting unsolicited manuscript submissions, but fiction submissions open in September 2017. Carlos Fonseca fashioned the namesake protagonist of his debut novel, Colonel Lágrimas, around the real life of Alexander Grothendieck, a mathematician who earned the 1966 Fields Medal. The result radiantly expands the genre of historical fiction so far it breaks the mold. Who is this Colonel Lágrimas? Straight hair, small hands, Jewish, suffering from face blindness (a disorder known as prosopagnosia), megalomaniac likely gone mad in his old age, now in search of peace before death. He has barricaded himself in the Pyrenees to write his own life story as well as total human history. Yet after decades, he’s still struggling with the project. The man appears to have a serious case of writer’s block engendered by attempts to reconcile his memories with facts. Vast quantities of coffee prove inadequate to help him navigate this maze, even though he “was born in a caffeinated century.” Is his mind slipping? Finally he reaches out to alcohol. Within this layered tale, Fonseca ponders the personal, political, philosophical, technological, and literary forces that brought us to the present era. He examines the obsessive consumption of televised images. He considers “the border of what is private.” By framing the colonel’s self-imposed imprisonment alongside the narrator as all-seeing watchman, the author generates a vivid metaphorical panopticon. Colonel Lágrimas delves into identity: Is it feigned? “To don a mask was to refuse a destiny.” Fonseca explores the role of memories, both real and false, in one’s sense of self. Does the colonel want to remember—or does he want to forget? Here is a man endeavoring to rebrand himself. The narrator tries to enlist readers in a group attempt to unmask the colonel, to draw “a kind of cubist portrait of this tired man” who was born stateless—whose country is the globe. During his youth in Mexico, the colonel met a character called Maximiliano Cienfuegos (a mashup of names from times gone by in Mexico and Cuba). After only one game of chess together, the colonel bombards Cienfuegos for decades in a cryptic correspondence from all over the world. 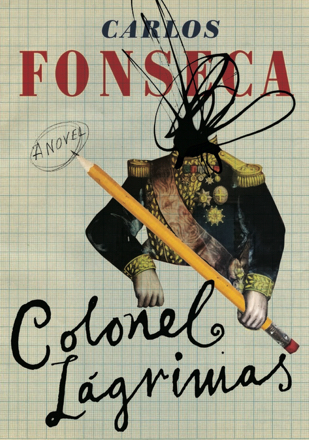 Fonseca scrutinizes Colonel Lágrimas, tossing small bits of quantitative information like breadcrumbs via the novel’s storyteller, who occasionally pulls back to muse about this character against a backdrop of world events over the colonel’s long lifetime—portraying the colonel as a brilliant Forrest Gump. Then the raconteur zooms in to focus on what the man’s doing at his desk that very moment. Fonseca becomes both narrative cinematographer á la Bertolt Brecht and pointillist wordsmith á la Georges Seurat, ultimately creating a verbal graph of the last hundred years á la Edward Tufte. Nota bene: “lágrimas” means “tears” in Spanish.